Where is Spring?? This time last year we were well into summer temperatures, but this year winter won’t go away! I know I’ll be regretting this statement come August, but I am ready for some sun! I have to admit though, we’ve had a few gorgeous days recently, even if they did come with a biting wind. The jonquils have come and gone, so hopefully that’s a sign that the rest of spring will follow suit. On a slightly different subject, has anybody else felt like March has just flown? Typically it’s February that whizzes by, and before you can say “Bob’s your uncle”, the most unusual things begin to happen. (Name that movie!) But this time it was February that felt long instead of March. I’m sure it had nothing to do with the fact that I was anticipating the visit of a certain precious, loveable, adorable, kissable, unbelievably cute baby nephew of mine. 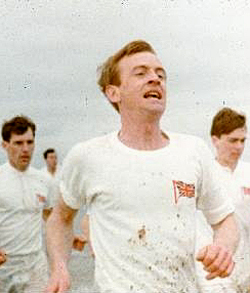 Last night my family watched “Chariots of Fire”. (I want to know how many of you now have the theme song playing in your head? How many, how many, how many? Ok, I’ll stop quoting movies now.) It has been YEARS since I’ve seen it, so although I know the story well, I couldn’t remember exactly how the movie played out, particularly that of Harold Abrahams’ part. It is such an inspiring story, especially if you read about the rest of Eric Liddell’s life. The movie led to a family discussion on the Sabbath, or more particularly on keeping the Sabbath. Do you see Eric Liddell’s choice as a moral obligation to God because of the 4th commandment? Or do you see it as a personal obligation for him to maintain a clear conscience before God? Either way I highly respect him for honoring God in his choice.